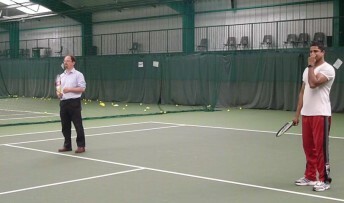 Cambridge MP Julian Huppert faced a tough challenge on the tennis court after joining a game with blind players. Julian met members of VI Tennis Cambridge at the city’s Hills Road Tennis Centre and soon discovered that, despite their sight loss, they were an impressive force. “These players were an inspiration,” said Julian. “They had developed amazing skills on the court and really put me through my paces. “It was great to see people enjoying a game which proves a challenge to even the fittest player. I learnt some valuable skills and really enjoyed it. The players at VI Tennis Cambridge, run by Vision4growth CIC, have played for over a year using a unique sound ball imported specially from Japan. They are encouraged to play to Lawn Tennis Association rules despite their sight loss and 18 players joined Julian on court to show their skills. Fiona Musgrove, Director of Community Services at Vision4growth said she wanted to see more investment coming from the Lawn Tennis Association for the sport. Vision4growth recently organised its first tennis tournament at Hills Road Tennis Centre where four out of the six players from Cambridge taking part received medals. On Friday, October 4 Vision4growth CIC attended a forum looking at the future of VI tennis nationally at the National Tennis Centre, London as part of a national VI tennis tournament. British Blind Sport and the Lawn Tennis Association are asking players for their views on the game. Vision4growth is looking for sponsorship or funding to help develop VI Tennis Cambridge further. Anyone who can help or would like to become involved in V I Tennis Cambridge can email the group at:enquiries@vision4growth.org.uk or www.vision4growth.org.uk or follow it on Facebook.